My mother, Ruth Virginia Finke Spoon, entered the Cadet Nurses Corps in 1944 and graduated in 1947. 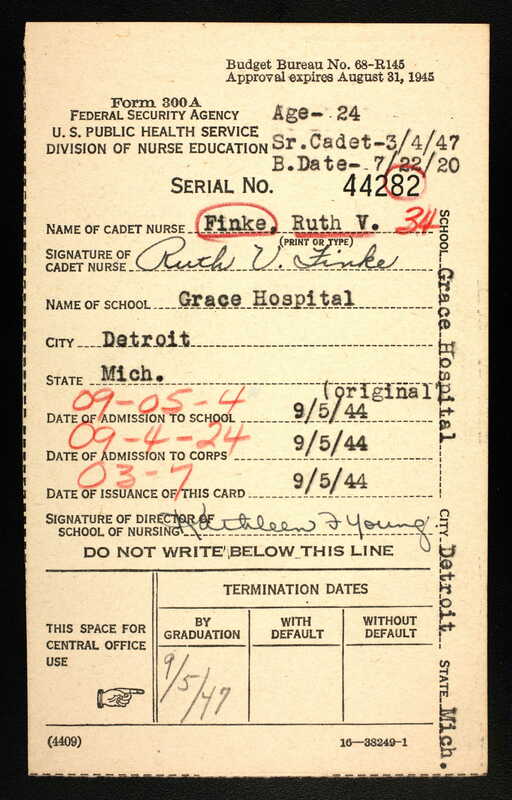 She was from Dayton, Ohio, but did her Cadet Nurse training at Grace Hospital in Detroit, Michigan. She worked as a nurse until she was married in 1951. Being a nurse made her a really good mom--I always felt very well taken care of if I was sick. She took a refresher course and went back into nursing in 1969. She passed away in 1990. I'm very proud that she served our country as part of the U.S. Cadet Nurses Corps.